Compared to ODF30, ODF30C added USB charging function. ODF30C utilizes a high power XHP 70.2 LED, and runes on one high capacity 26650 Li-ion battery. 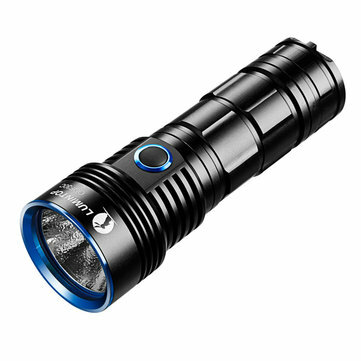 It emits a max output up to 3500 lumens and a max burn time of 250 hours. By adopting an orange peel reflector and flood light design, it creates a wide and balance beam. Compact design, side switch simple UI well fits for one hand control. Three output levels plus three hidden modes allow it to meet for various applications. Tail standing, stainless steel protection ring, IPX-8 waterproof classification, ODF30C is a trusty companion in various outdoor activities like caving, searching, hiking, camping etc. General mode: Low-Med-High (with memory); Hidden mode: Turbo, Eco and Strobe. ①ON/OFF: Single press for on, press and hold for 2 seconds to turn off. ②Output selections: With the light on, click to cycle through Low-Med-High. ③Turbo: With the light on, quick double clicks to enter Turbo, another click will return to previous general mode. ④Eco: When the light is off, press and hold the switch for 2 seconds to enter, another press will cycle through Low-Med-High. ⑤Strobe: Under Eco mode, double quick click the switch to enter, another click to exit. ⑥Lock-out function: When the light is off, press and hold the switch for 4 seconds till flash to enter, loosen the tail cap to unlock if needed. Under lock-out statues, the light can only lighten up on Low until released when press or click the switch.